Mobilegs appears in the website featuring the best in new design--see link for 'Style of Design'. mobilegs was featured in United Kingdoms GDR (Global Design Report). 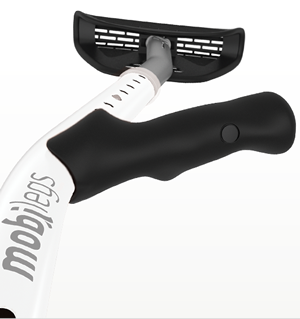 Enabling Design's 'Moving with Mobi',featured Mobilegs in an issue devoted to 55+ adults. According to the British Design Counsel, by 2020, one in every two European adults will be over 50. The article features other mobility and support items such as a surf board for paraplegics, a stylish collection of braces and supports. Mobilegs to appear on Fox's 'So You Think You Can Dance'. Due to a Sunday morning tip from my Fox watching friend Johnathon--found out that gifted dancer, Alex Wong was injured on Saturday's performance. I was able to make contact with the new host of 'So You Think You Can Dance' contestant Alex Wong on his Facebook page--and a PR packet sent to Fox Monday morning. He sustained an injury Saturday that requires surgery on his achilles tendon. To my surprise, he quickly replied back--we were in touch via phone and e-mail within the hour. We will be overnight shipping Alex a set of Mobilegs within the next few hours. He will be donning a pair of Mobilegs as a member of the audience and as a potential guest host of the highly watch Fox show within the next few weeks. Great PR for Mobi as we launch our first product. During a few stolen minutes at Starbucks I spotted a young millenial crutch-user. While he waited for his latte. I asked him how long he had been on crutches, with a pained expression, he replied-'five long months'. Crutches user Bryan sustained a knee injury that required extensive surgery. During that time beyond the discomfort of the crutch use, he had to have the aluminum crutches replaced at lease three times--some due to foot replacement, some due to total structural failure. He and his companion sat down for a moment while I pulled up Mobilegs.com to show him our product. He was instantly enthralled and asked 'where can I get these!?'. I told him we were eagerly awaiting our first shipment. I know that this was a perfect opportunity to positively impact the last weeks of his experience, gain some exposure for Mobilegs and to have him blog about his experience. Gizmodo picked up our little company-that-could story yesterday afternoon. The 'Storied Chair Designer Invents a New Crutch' entry spurred some interesting banter--including one bloggers request for a flame-thower upgrade. A great article was published in MedCity News on 5.12.10 about Jeff Weber and the creation of Mobilegs. Enjoy!